This is a guest post written by fellow dietitian Leanne Ray. She is a healthy meal prepping expert and food blogger over at LeanneRay.com. I’m so excited to have her here to share her easy meal prep ideas with you all! 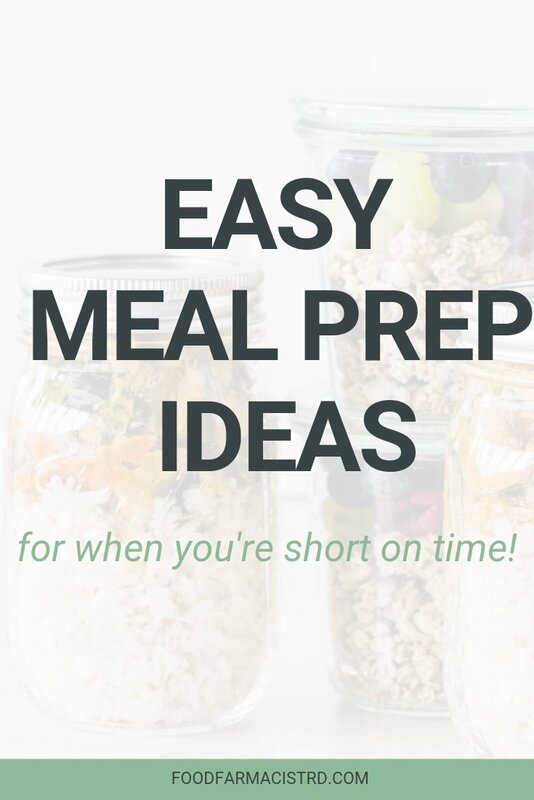 We all face the issue of limited time during the week and consequently, most of us assume that healthy meal prepping is just “one more thing” to add to our already insane to-do list. But I’m here to prove to you that you can and will SAVE time if you learn to do it in an efficient and practical way. First, a quick example. I once had a nutrition coaching client who was going to the store multiple times every week (like, every night). Each day when she got done with work, she quickly scrambled to figure out what to eat for dinner. As you can imagine, she was completely burned out on planning and cooking and basically “winged it” with whatever boxed/processed food she could find in the pantry nearly giving up on cooking altogether. In her mind, meal planning and prepping would only add to her stress level but after we got to talking, I could see things slowly start to “click” that setting aside some time on the weekend to create a game plan for the week would actually save her time in the long run. In short: Use 1-2 hours of brainpower once (Sunday), instead of 1-2 hours of brainpower every single day of the week. 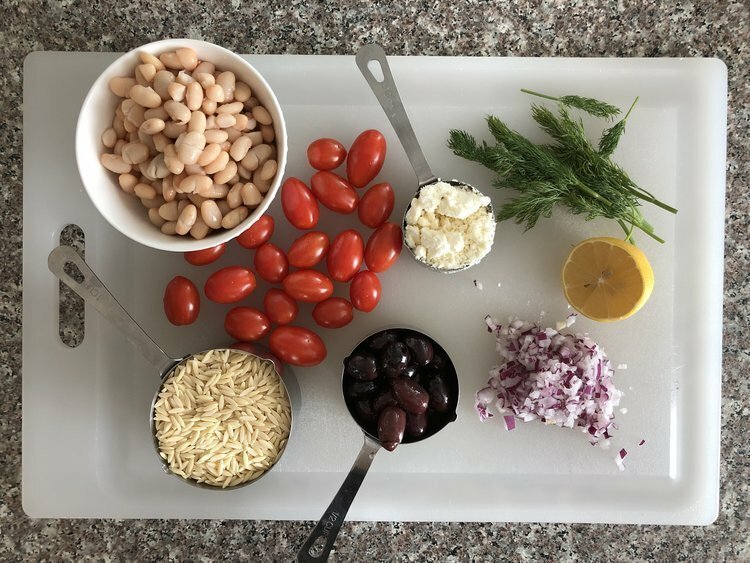 I like to think of easy meal prep as knocking out a few key components to make your weeknight cooking routine smoother and more fun. If you could throw together a fresh, healthy and delicious meal in less than 30 minutes most nights, would you cook more? Tip #1: Stock the right tools to set yourself up for success. Any newbie home cook knows that the struggle is real when you try to follow a recipe only to realize you don’t have the necessary tools on hand. Luckily there are just a few basic items that will make prepping a whole lot easier, so let’s start there. Food storage containers. If you plan to prep food, you need somewhere to put it! These are really nice because you can easily see what you have on hand (plus, upgrading from orange-stained plastic containers to pyrex will make you WANT to pack lunch everyday #adulting). A sturdy silicone cutting board and one sharp knife that actually chops vegetables with ease. Ditch the old, warped cutting boards and invest in one awesome one. Bonus if it has rubber grips, but you can also put a damp towel underneath to keep it from sliding around on your counter. Similarly, you’ll want a sharp knife if you plan to prep any sort of vegetable (and we hope you do!). I love an 8-inch chef’s knife as my “workhorse” which basically means, it works on just about everything and I grab it multiple times per day. Mason jars for sauces and dressings (jars can also function as food storage). Tip #2: Don’t let the thought of healthy meal prep overwhelm and paralyze you. Make something that you can easily grab for breakfast all week long. Even if you have the time to sit down and enjoy a meal before you leave the house, a no-fuss breakfast that requires little brainpower is always appreciated, especially pre-coffee. Ideas: Overnight oats, mini quiche cups, chopped fruit, homemade snack bars, and smoothie packs! Batch cook grains for buddha bowls and your lunches will be a breeze. To keep things interesting, change it up from week to week so you never get bored. Try farro (my personal favorite), couscous, bulgur and different variations of quinoa. When you’re in need of a quick packed lunch, just follow this formula for seriously satisfying grain bowl and you’re good to go. Wash and chop vegetables you’ll need for dinner. Once you have all of your tools out and dirty, you may as well do as much as you have time to save on cleanup later. Tip #3: Multitask so you aren’t tied to the kitchen. Roasting a pan of vegetables while you clean up the house, do laundry, or finish up other tasks is simple, and there are endless options for repurposing them. If you have an instant pot, you can use it to batch cook protein for salads. It’s hands-off and cooks fast and furiously. Ideas: shredded chicken breast, hard-boiled eggs, or dried beans (which usually take an entire day on the stovetop). Healthy meal prep does not have to be overly complicated or time-consuming. If you invest a small chunk of time on Sunday to make some healthy staples, you’ll reap the benefits all week long! Trust us when we say that you’ll never be happier come 6:00 pm. What will you meal prep this week? 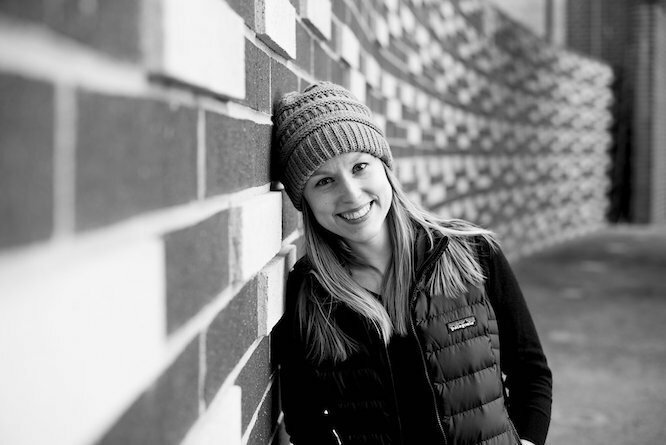 Leanne Ray is a Denver-based registered dietitian on a mission to make cooking and nutrition practical for even the busiest of people. She offers 1:1 virtual nutrition coaching services in addition to hosting in-person educational events and creating simple plant-powered recipes on her blog. Learn more about her nutrition membership program.